Gaudet Luce Golf club (pronounced Gore-day Loose) is set in a very nice part of rural Worcestershire. Located on the edge of Droitwich Spa, the club is very easy to locate as it is only 5mins from the M5 and has named signs from the town centre. Worcester is only 20mins away, and Birmingham about 40mins. As a new TSG Club Partner, we sent TSGer Andy King to check out the course and share with his fellow TSGers, his view on the course. It is thought Gaudet Luce is Latin for something like ‘Rejoiceful Light‘ as we were told by the Company Director whos family has always owned this course since its start in the late 90’s. I personally love a golf course you drive through part of to get to the clubhouse, you get a little taster, and Gaudet Luce doesn’t disappoint. The car park is big but there are several other businesses onsite, so parking might be a problem at certain times. We had no issue, and probably will be fine most times…. The course and clubhouse are relatively new, established in 1995. So, as you’d expect, the clubhouse is very modern, clean and tidy. All staff, bar, shop, and just generally were friendly and helpful (not only to us, but we noticed they stopped to chat, and were as helpful as they could be to members we saw onsite as well ). We had some food and drinks after, which were very nice and reasonably priced, the bar area although good, if it was used to cater to a large society might get a bit cramped, 30 or so would be fine but hey may have other areas for larger groups. The Pro shop is not huge but is well stocked, and recently incorporates the retail company, American Golf, so you know what you’re going to have on offer. Speaking to the shop staff about the course was informative about 150yrd markers etc, however, the weather lately had been so good, there was nothing for them to warn us about by the way of wet or muddy parts. 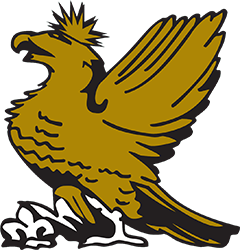 There’s a teaching school available with details on the Gaudet Luce Golf Club website. 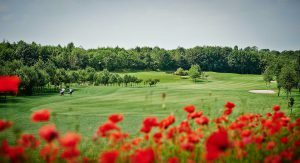 There are two courses, the 9 hole Par 3 ‘Hazdor’ course which looked very nice and is used for a quick round, practice, and lessons etc by members and guests. However, the absolute star of the show is the full 18 hole ‘Phoenix’ course. This may not seem to be ‘long’ by modern standards, but if you don’t bring your ‘A’ game, you may go home shaking your head. However, you WILL want to come back for another go…frankly, it’s a stunner! A beautiful Parkland course that’s got the balance just right. Not too daunting for high handicappers, not too easy for low handicappers. The condition in early May was excellent. Good quality Tee boxes with lovely features like box hedge surround, fairways that were springy and lush, just the right amount, and Greens that were true and a good speed. There is some water to negotiate, but again, it’s not too much. Everything was high quality. It is quite tree lined (especially the front 9), but not too punishing, and the trees etc. frame the course beautifully. It is a course of two halves, the front nine being tight in places but shorter. The back nine more open but longer and with more water and some slopes to contend with. From the first nice wide downhill tee, although OOB down the right, the course unfolds in front of you, with all holes offering something different. The 2nd being a gentle downhill Par 3, but watch out for the pin placement. However, the tricky 4th demonstrates the ‘short/tight’ idea though. At only 263 yards from the yellows this Par 4 seems easy…it’s not. With an entrance to the green through the eye of a needle, you need to be pinpoint accurate. The 353 yard, 7th is quite straightforward…IF you get a good intimidating drive away. Quite a carry over water to the fairway will worry some. The Par 5, 8th will get the grey matter going, calculating distances over ( or not ) brooks, and around ( or NOT ) ponds to a very very shallow green. The more open back nine starts with a great Par 3, but straight away, you see the water coming into play. The downhill 11th is also worthy of a special mention, as again the view sweeping down is fabulous. Another Par 3 at 12 shows a very popular hole that has DANGER written all over it. ALL of the Par 3 holes stood out as special, but my favourite hole was the 17th. Off the yellow tee, a 502yrd Par 5, that the 2nd half is STEEPLY uphill to a platform green. However after all that effort, turn around and look back down the hole….the view will take your breath away (even if you might need a buggy to be ABLE to breathe after that climb!). The course is easy to find your way around, as most tees are within sight of the previous green, and where they weren’t, there were good signs showing the way. There ARE birdies out there to be had, but you need to play carefully to benefit. A real thinkers course! Practise facilities are also very well catered for. A good full range, practise putting areas and the helpful shop Pro’s all there to prepare you for your round. Lessons are available, and the club seems very well set up for societies etc. In fact, the clubs website is one of the most detailed I have ever seen. 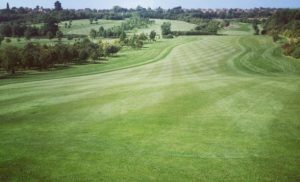 From their price range to play and other offers onsite, like FootGolf, membership, and group golf days ( even to the opening and closing times of the kitchen, and online menu’s!!). There also looks like a lot going on away from the golf. With special offer meal deals, and entertainment galore. I would seriously look into membership here…if only it wasn’t nearly 200miles from home !! Coming from the London area, I thought the cost was very good value for money, even at the weekend. All in all, Gaudet Luce is a fantastic club and course making us feel very welcome and is a delight to play. A real gem, well worth a trip. Really struggling to think of ANYTHING to criticise. Yes, some may argue you can hear the M5 most of the way around, but personally, it’s not too loud and I managed to ‘blot’ that out after a few holes. I would highly recommend this course to any local people, or, like me, a visitor from further away. You’ll love it. TSG Verdict: 4.5 out of 5! 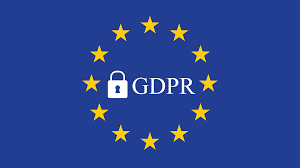 It explains how we comply with the EU’s GDPR (General Data Protection Regulation) legislation and the DPA (Data Protection Act). This policy will explain areas of this website that may affect your privacy and personal details, how we process, collect, manage and store those details and how your rights under the GDPR and DPA are adhered to. This website, www.thesocialgolfer.com complies with the DPA (Data Protection Act 1998) and the GDPR (General Data Protection Regulation), effective from 25th May 2018. The data from these forms are emailed to the address listed above and also stored on the website server of www.google.com most cases dating back to when each form was created. www.google.com never access or share this data other than by request from The Social Golfer Limited. By completing this contact form you agree to The Social Golfer Limited contacting you about The Social Golfer Limited services. You will not be added to any mailing lists and will only be contacted by The Social Golfer Limited (aka Ian Mullins) in relation to your enquiry. Your personal details will not be added to our database, and will not be used for any marketing purposes nor will they be passed onto any third parties. The Social Golfer Limited does not engage in email marketing specific to our services. Your personal details WILL NOT be used for any such marketing purposes nor will they be passed onto any third parties. The Social Golfer Limited creates a video and images at our TSG (The Social Golfer) events and do not share these with anyone apart from via our own website and social media feeds. If you do not wish these images to be shown on the website or in any TSG marketing materials, please let us know and we will immediately delete them from the website. If you wish to request for your personal images deleted from the website please email theteam@thesocialgolfer.com and we will delete them with immediate effect. We cannot guarantee or verify the contents of any externally linked website despite our best efforts. Users should, therefore, note that they click on external links at their own risk and we cannot be held liable for any damages or implications caused by visiting any external links mentioned. We take care of the processes around looking after personal data stored on our physical systems. Client photos/images are safely stored on our server supplied by UKservers.com and backed up to Google Cloud Platform. 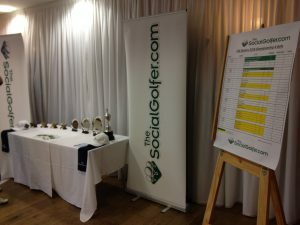 The Social Golfer Limited will use Youtube & Facebook, Twitter, G+ for sharing TSG event videos. Under GDPR legislation, a photograph/video may in some instances constitute a form of personal data where they can be processed to allow “the unique identification or authentication of a natural person”. The Social Golfer Limited will never photograph an individual as a means of unique identification or authentication unless consensually contracted to do so. Guests at our TSG events appear in photos taken by The Social Golfer Limited as part of the visual recording of the event in photos/videos. In terms of explicit GDPR compliance, TSG event attendees and guests are photographed within the parameters of GDPR legislation on the basis of ‘legitimate interests’. 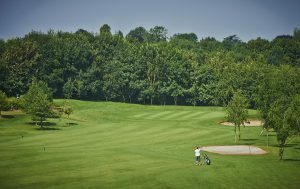 The taking of photographs of those attending our events, when viewed as a form of processing personal data, is necessary for the legitimate interests of The Social Golfer Limited as an event business unless there is a good reason to protect a given individual’s personal data which overrides those legitimate interests. We adopt a safe and responsible Social Media Policy. While we may have official profiles on social media platforms users are advised to verify the authenticity of such profiles before engaging with, or sharing information with such profiles. We will never ask for personal details on social media platforms. Users are advised to conduct themselves appropriately when engaging with us on social media. We may display any photographs & videos to promote The Social Golfer Limited. On The Social Golfer website and blog, on social media, on golf blogs, on golf photography related websites, in exhibitions, in advertising, brochures, magazine articles and other such material, providing that the images used are used lawfully and without damage to The Social Golfer Limited members. We understand the importance of protecting children’s privacy. Our website is not designed for, or intentionally targeted at, children. It is not our policy to intentionally collect or store information about children. You are required to be 16 or over to be a member of The Social Golfer website. We collect personal data about our prospective, current and former employees (including freelance workers) as follows: basic identification information, such as your name, title, position, professional history, experience, and contact details. We may, from time to time, e-mail you information to make you aware of our other similar products and services which may be of interest to you. If you do not wish to receive emails or post from us for these purposes, or if you want to be removed from our newsletter mailing list you can either select “unsubscribe” from any of the emails that we send you from our email provider CampaignMonitor. Alternatively, you can email us theteam@thesocialgolfer.com and we will remove ALL your data and any personal information from our files within 72 hours of receiving your request. From more information – visit our FAQ’s page. Cookies by themselves cannot be used to discover the identity of the user. A cookie is a small piece of information which is sent to your browser and stored on your computer’s hard drive. Cookies do not damage your computer. You can set your browser to notify you when you receive a cookie. This enables you to decide if you want to accept it or not. We also use your IP address to help diagnose problems with our server and to administer our website. An IP address is a numeric code that identifies your computer on a network, or in this case, the internet. Your IP address is also used to gather broad demographic information. We may also perform IP lookups to determine which domain you are coming from (i.e. : aol.com, yourcompany.com) to more accurately gauge our users. If you are unhappy with the way we handled your personal information or any privacy query or request you have raised with us, you also have a right to complain to a data protection authority in the place where you live or work, or in the place where you think an issue in relation to your data has arisen. With any legislation, there are always loopholes but you can be assured that everyone at The Social Golfer Limited takes the use of your personal data very seriously and as such, all the appropriate steps have been taken in order to protect your personal information. Having planted my ball on the 7th green at Peeble Beach (at the TSG Open Championship on a simulator! ), the next thing I know I’ve won a golfing trip to Sicily courtesy of Golf Escapes and Il Picciolo Golf Resort. 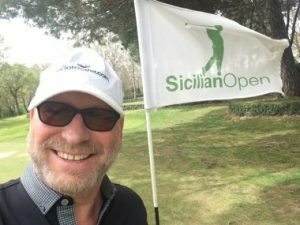 And having added a few dates to our trip, here’s my review for my fellow Social Golfer members to enjoy…. 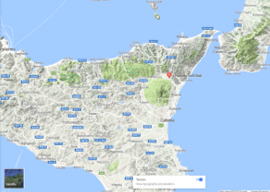 Il Picciolo Golf Resort in the centre of the Mediterranean island of Sicily is situated roughly 50 miles from Catania Airport. The hotel is over half way up Mount Etna the scenery is spectacular. The transfer cost is 120 Euros (one way) and takes 50+ minutes. The hotel and course itself were built in 1989 but sadly the outside of the hotel reflects this and is badly in need of refurbishment. On arrival you approach a rather dated reception, where details are taken, language is not a barrier but no help with luggage was offered? Sadly, the first thing to note is the hotel is not overly disabled friendly, some steps are not accompanied with handrails. However, the rooms are of a good size with on suite bathroom facilities. They are clean and the chambermaid service is very good. Towels and shower gel etc changed every day. The room boasts Sky television and a mini bar. Only four coat hangers per person encourage you to travel light, but there’s plenty of space for clothing and storage is available. The restaurant was very spacious but a little dark, the staff were courteous but surely on occasion. The three-course evening meal costs 29 Euros and was very good, most of the time. The Saturday evening buffet was superb, only the last night did I feel the food was of a poor standard. The breakfast layout is bland but of good quality. The service during breakfast seemed more relaxed. I fell one evening slipping on a discarded cucumber slice and the staff were very quick to act, cleaning up the debris, but alas did not follow up to ask if this disabled man was injured, so we felt could have been handled better. The hotel catered for coach parties which stayed one or two nights at the hotel, staff seemed more attentive towards them than the longer staying cliental. The cocktail bar was run by a very efficient member of staff for most of our stay (7 nights) but when she was not on duty, she was replaced by staff who obviously did not enjoy the role. The drinks were not cheap at £7 for a G & T, we were never offered a complimentary appetiser even though it was part of our deal?! As far as entertainment goes it karaoke style. One evening a singer sang along to backing tracks until midnight (about 5 hours), alas she was the only entertainment of the week and whilst it was ok, New York New York wears a bit thin after a while! The spa was very tranquil and ticked many boxes as to treatments. The staff there were helpful and made it a very enjoyable experience. Information on the few trips (3) offered was sparse, no leaflets were offered. A trip up Etna was offered for £100 but no meal made it seem very expensive. Getting a taxi return to Taormina was over a £100 it was 30 minutes away. To be brutally honest, overall, the staff communication was a problem the whole week. There was a power cut one day, no explanation was offered to the guests and we only got into our room by seeking help from a cleaner? The Clubhouse is situated a few hundred yards from the hotel. Your round can be booked through the hotel, but buggies have to be paid for at the club. The Pro at the club is friendly and his staff are very helpful. 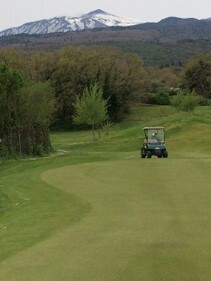 The office doubles with helicopter rides up Etna, so they are not only focussed with the golfers. A spacious locker room is accompanied by shower facilities. There are drinks machines for refreshments and confectionary. There had been a fire in the kitchens, so no other food was available at the golf club which was a little disappointing. However, the Practise facilities are VERY good, a driving range, practice bunker with plenty of sand in it, a dedicated chipping green and practice putting green. I was given free practise balls – refreshing as that wouldn’t happen in the UK. A round of golf is not cheap at 85 Euros buggies are 45 Euros. The course is nicely set out with some challenging holes but the clover (just off the fairways) is four inches long and thick. Lost balls are inevitable as the fairways are no more than 20 paces. I felt this was too penial, looking for balls becomes a bit of a chore when you’ve hit a good shot. This is a very undulating course so if you’re going to walk be prepared, the temperature can fluctuate 10 or 12 degrees while you are out there. A fair bit of work needs to address these issues to bring the course up to its best. 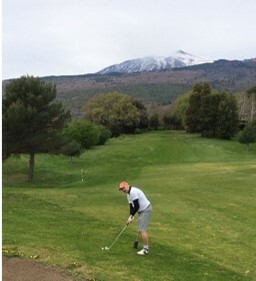 However, one thing I will always remember is the scenic backdrop, the views of Mount Etna are spectacular…. and would make me return just to view again. In summary, Il Picciolo Golf Resort could be an exceptional course but it really needs a lot of work on it to get it above a 3 out of 5 rating. Would I revisit Il Picciolo? Probably not until I see improvement in the course, its nowhere near the standard of courses for the same money in Spain or Portugal. I think its pricing its self out of the market of the average golfer if it wants to attract the better player a lot of work needs to be done to compete with the Algarve etc. Twenty-eight golfers and members from the popular Online Golf Club and Golf Society gathered at the Essex club, all hoping to be this year’s TSG Masters Champion golfer. 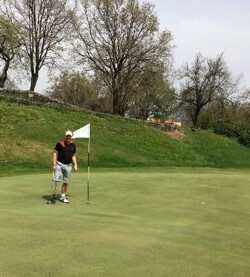 This mixed golf event provided plenty of healthy competition and while some TSGers were familiar with the course layout, most were new to it. The field, ranging from 4 handicappers to 24, played the Childerditch and the Warley ’1 to 9′ loop, two very different layouts offering their own challenges, the latter including some superb water features. 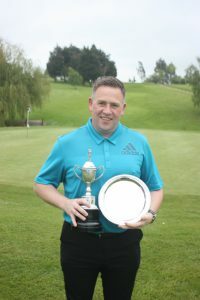 As always, it was the greens at Warley that proved the real test, with only six players reaching 30 pts but after 18 holes, it was a local boy David Johnson who triumphed by scoring a respectable 37 pts (three shots ahead of the field) to become the new TSG Champion. 2nd was Judy Lilley (Kent) with 34 Pts, with Martyn ‘Speedy’ Miller 3rd (Essex) on 32 Points. There was also some fun to be had with 2 x Nearest Pins and a ‘Straightest Drive’ keeping the day alive and fun. In addition, two golfers received ‘Trevor’ medals for their ‘Chip-In-Birdies’ – in memory of former member Trevor Sandford (famous for his golfing odyssey around the M25 in 2012).